Stevan Allred's new book propels readers into a wild and wacky sprirt world inhabited by talking human-sized birds, a nasty crow and a Hindu goddess. 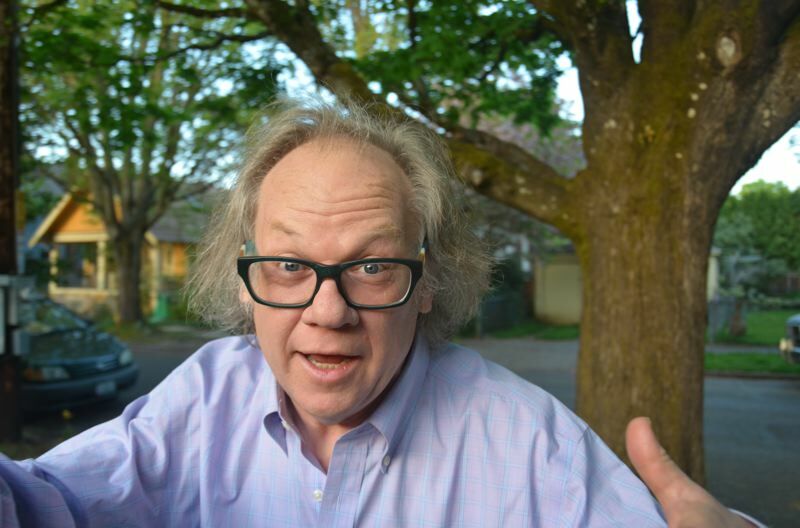 Estacada author Stevan Allred knows something about grabbing a good story by the tail and hanging on for dear life. 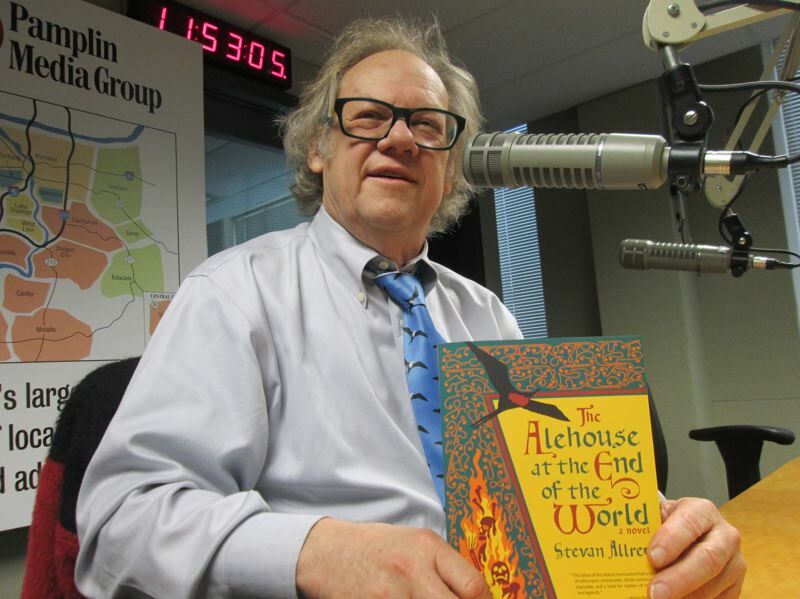 His new book, "The Alehouse at the End of the World," hits bookstores this week. It's a weird, funhouse-mirror sort of story set in a spirit world floating through time in the belly of a gargantuan creature that must be sedated or it starts chomping on anything in sight, including the material world, where the rest of us live. Allred describes the book — 130,000 words and five years of his life — as a classic "hero's tale" loosely set in the 1500s on an "alternate earth" where things are slightly askew. The main character is a fisherman who is lured/enticed/summoned to the Isle of the Dead to rescue his lover's soul, which sleeps in a clamshell buried deep in a beach. On his way, the fisherman is swallowed Jonah-style by a whale and his skin turns blue after the great mammal regurgitates him on the island's sandy shore. There he meets the island's "lesser gods," a handful of human-sized talking birds, including a pelican who can change into human form, a frigate bird who struts around with a pirate's pistol in his belt and a giant crow who fancies himself king of the spirit world. Picture the old cartoon villain Snidely Whiplash in feathers and you've got crow. There's also the Hindu goddess of rice and fertility Dewi Sri, a central figure in the story's big payoff. Throughout it all, Allred paints a portrait of a world suspended in magic, coated with mythology and impervious to explanation. Tribune reporter Kevin Harden talked with Allred about the book and his writing. Here is an abbreviated version of that conversation. To hear the entire interview, listen to the podcast. TRIBUNE: You call it a hero's journey, and the journey ends OK. Some of the characters pay a price for what they do. You say that you didn't start out with an outline for this story. You let this story take you where it wanted to go. Some authors don't do that. ALLRED: Yeah. I think each of us has to find our own way to be a writer. Many writers use an outline, a plan, a thing that they're going to follow. And that's the kind of book where the author knows something about a story and they want you to know it the way they know it. Writing is itself an act of discovery. It's my feeling, my belief, that a different kind of energy comes through on the page when you let the story take you. That feeling of discovery and exploration is kind of the wet edge of the narrative, if you will, like the wet edge on a paint brush that's pulling us forward. And it just lent a different kind of energy to the storytelling. TRIBUNE: The story has that energy. It has a very, I want to say, sort of a fever dream vibe to it. It draws you in and you care about these characters. It's only what, six characters? ALLRED: Yes, six main characters. Sounds about right. TRIBUNE: A couple of them who you single out immediately as being the bad guys. But the others are very good, and they're good in their own way. Was that your intention when you started this? ALLRED: It's a funny process, writing like this. You are inventing something and discovering it at the same time, as if I were climbing a rope and braiding it at the same time I was climbing it. It's actually impossible to do that. And there's something kind of impossible about writing this kind of novel. What I knew going in was that there was going to be an incident with a whale and the main character. It took me a while to write my way into this story. I started someplace nowhere near where I ended up and things fell away. But I really didn't know what kind of story it was right away. The incident with the whale sort of opened the door for me. I thought if readers are going to stick with me after this happens very early on, I can go anywhere. So where do I want to go? TRIBUNE: You went to the Isle of the Dead. ALLRED: Which originally I called the Land of the Dead. But somewhere in the drafting I thought, no, I'll change that. I wanted it more contained. Who am I going to find there? I had no idea. TRIBUNE: This book is filled with a sort of Lego house of mythology. You have pieces of mythology that are real. Dewey Sri is real. Is the Kiamah monster (pronounced KEE-a-ma) a real creature? ALLRED: That's a creature out of a Native American tradition, from the Nimiipuu people, whom we now know as the Nez Perce. This goes deep into my childhood. I had two books that my mother gave me when I was grade school, eight years old or so. One was "Nine Tales of Raven" and one was "Nine Tales of Coyote." Both books were written by a woman named Fran Martin. They were collections of Native American stories, legends, myths that really captivated me when I was a boy because the storytelling was so different. The storytelling in those books was different. It had an element of magic to it that was unlike anything else I had encountered at that time. There's a certain acceptance of mythology as just the way it is. It didn't need to be explained. I thought that's a really great way to tell a story. TRIBUNE: And you told that kind of story. You say that the spirit world was on the outside of a log floating through time, and the Kiamah monster swallowed the spirit world and is "atop of that hollow log, like a lizard basking in the sun." Are people going to look at this and say, well wait, that's not right. That's not Greek mythology. That's not some other mythology. That is a collection of mythology, a stew of mythology. ALLRED: A collage. One way I think of it is as a gumbo. They're all good mythologies. All of this really for me goes back to the work of Joseph Campbell, who is the man who elaborated what is now known widely as the hero's journey. What he discovered is that there is a core story that surfaces over and over again across time and cultures. He called that story the hero's journey. It's widely known in Hollywood circles. For example, lots of movies, like "Star Wars," is based on the hero's journey. When I sat down to write a novel, I've written a couple of what I call starter novels before I know how long it takes. I know I'm going to be alone for a long time, which I like. You can get bored with your own work, and I wanted to write a story that would keep me interested. Mythologies are oral traditions. Often the magical elements are simply presented as "this is the way it is." They are not questioned, they're not explained. They simply are. And that I believe is what gives mythology it's power, it's the lack of explanation. We live in a world full of explanation, full of science and journalism and all sorts of ways that the world is explained to us. But I wanted to enter a world in which things are a little bit more boundless. TRIBUNE: Did you find that troubling while you wrote? Did you feel the need to explain things to the readers? ALLRED: There are a number footnotes and they say directly: Dear reader, let me explain a little something here that you may not understand. Sometimes those explanations might lead to more questions and that's kind of the way I want to leave it. But, no, I didn't feel obligated to explain. What was exciting for me was you kind of paint yourself into a corner every now and again you've set some things up and, you have to come up with some writerly sleight of hand to get out of that painted corner. And those moments in the writing are just joyful fun for me. There's another old piece of writing advice: You're never going to surprise a reader if you don't surprise yourself first. And it's those moments of surprise that I write for and that I think a spill out onto the page and the reading experience. TRIBUNE: Many of the characters in your book, Dewey Sri for example, come off as very solid characters. She's pretty much the heroine who pays a heavy price. ALLRED: Yeah. And that's consistent with my worldview. If you want to take this story and think about where we are right now in this country, in the world, the story of a small band of heroes who stand up to a tyrant and, even at the darkest hour, never quite give up. Their hope never gave into despair. That's what I think we need right now. TRIBUNE: Your first book was "A Simplified Map or the Real World." It's a collection of stories set in the fictional town of Renata, Oregon. You're from Estacada. So I take it that your life there informed most of these stories in some ways. ALLRED: Yes. And in some ways, no. I am not a portrait worker. I don't paint portraits of people I know and change their names and write fiction around those portraits. There are 36 characters in "A Simplified Map of the Real World" who get at least a scene, and that is 36 different versions of me. TRIBUNE: You teach it The Pinewood Table (a Portland-area critique group that meets once a week or so). When you are teaching peers what is it that you tell them that they should do? Or do you just say, make your own journey? ALLRED: That's a big set of questions for me. Here's why. Here's the dirty little secret about "teaching" writing. First part of the secret is it can't be taught. It can be learned, it can be coached. I think of myself more as a coach, although we use the language of the classroom and we call it a class. We say we're teaching, but really what we're doing is coaching. So I think it's much more akin to someone who comes to us with a certain desire to write that's fundamental and the ability to put some pages on the table week in and week out, you know, some facility coming in. The other part of the dirty little secret is that to coach, to teach writing is very labor intensive. So people come to the classes with us. I teach with a woman named Joanna Rose, who's also a writer. I'm a poet, an essayist and she's a novelist. She wrote a novel called "Little Miss Strange." People stay with us for two, three, five years. They may come and go a little bit, but it's a long process to get through a book length manuscript. We get to know their work well enough that we can maybe light a candle for them as they're out there in the dark of their own work, because we've been out in that dark before. We kind of know what it feels like to be out there. But again, to preserve that feeling of discovery for the writer herself or himself, we think that's pretty precious and it yields a certain kind of story. TRIBUNE: Portland is, it seems, just overflowing with talented writers. It also has amazing, talented publishers. You took this book to Forest Avenue Press, which is run by Laura Stanfield (a former Pamplin Media Group editor). ALLRED: Yeah. She started out as one of our students. She's an accomplished writer herself. TRIBUNE: Yes, and she's an incredibly brilliant woman. But there's a whole boutique publishing industry in the region that people do not know about. ALLRED: Yeah. This is an amazing town for writers. It is abundant with writing talent. Portland and the whole region is. There these publishers, these little micro-publishers, that are extraordinary. Listen, there's not a lot of money in this industry. It's like pro sports or the entertainment industry, you know, the 1 percent at the very top get 99 percent of the money, and the rest of us are just chasing all the crumbs. We're in this because we love it and we can't stop ourselves. And those micro publishers are really important part of it all. As are all the small literary journals that are around. A lot of them are university presses, some of them are standalone, you know, like The Timberline Review, Tin House. These are very important places where writers can get a work published and get a little sense of accomplishment in the world on their way to something bigger. TRIBUNE: Did you purposely take this book to Forest Avenue Press? Did you say, I think you should publish this rather than some other publisher. ALLRED: I wanted this to be a Forest Avenue Press book right from the beginning. Forest Avenue Press and Laura published my first book. I was her first author. 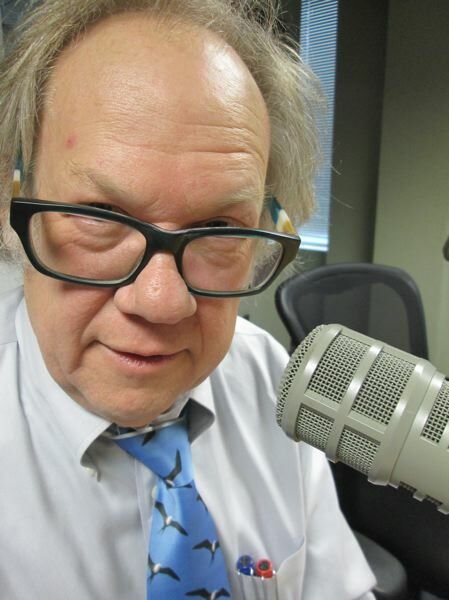 TRIBUNE: "Alehouse" comes out in November, and there's also an audio book. ALLRED: The audio book will come out Dec. 4 on Blackstone Audio. I am the reader for the book. I am very fortunate to be in that position. Most authors do not get to read their own work. This one called for an exciting performance out of me because I found myself doing all these voices for the different characters. So it's a little bit like Harry Potter for adults, where you've got an actor who's really playing all these characters. It's very much a performance. I've either made a complete fool of myself, or I've turned in something that's going to be pretty entertaining with all these different characters. 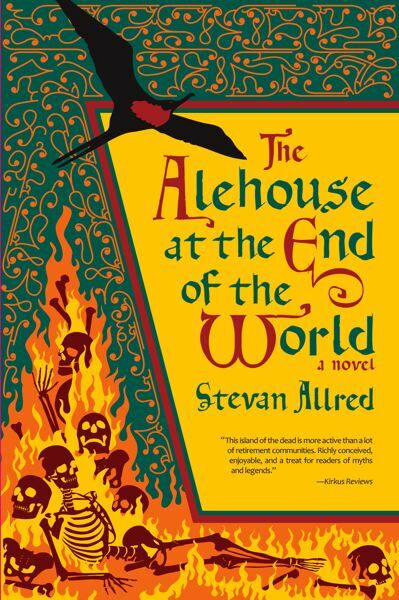 "The Alehouse at the End of the World."